We love using yall’s stuff, and are doing some Japanese dragon artwork using the new lime green pearl and bright yellow metallic candy pearl to highlight the brushwork. This car has electric blue candy pearl in the blue side of the car base coat, Bronze copper candy tint pigment in the clear on the wheels (the blue side is over silver base, the gray side is over black base), more Bronze copper candy tint pigment highlighting the fish scales that was mixed with 1 shot clear and brushed straight on, Deep pink pearl in the highlights on the cherry blossoms that was also mixed with 1 shot clear and brushed straight on, there is also some Silver crystal pearl mixed in with the white 1 shot highlights on the blue side of the car. in all I think we used 2 full bags of Bronze copper candy tint pigment and 1 full bag of the electric blue pearl. 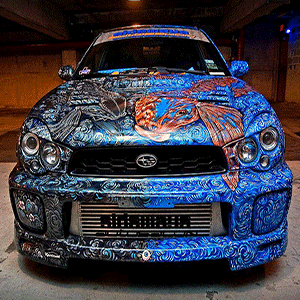 The entire car took about 720 hours to do, the artist is Cindy Raschke (www.cindyraschke.com ) and the technical paint and body was all performed by us here at Sideways AutoSalon.